TrafficGuard detects, mitigates, and reports on ad fraud before it hits digital advertising budgets. Three formidable layers of protection block both general invalid traffic (GIVT) and sophisticated invalid traffic (SIVT) to ensure that digital advertising results in legitimate advertising engagement. This destination is maintained by TrafficGuard. NOTE: The TrafficGuard Destination is currently in beta, which means that they are still actively developing the destination. This doc was last updated on March 4, 2019. If you are interested in joining their beta program or have any feedback to help improve the TrafficGuard Destination and its documentation, please let their team know! The first step is to make sure TrafficGuard supports the source type and connection mode you’ve chosen to implement. You can learn more about what dictates the connection modes we support here. Search for “TrafficGuard” within the Destinations Catalog and confirm the Source you’d like to connect to. 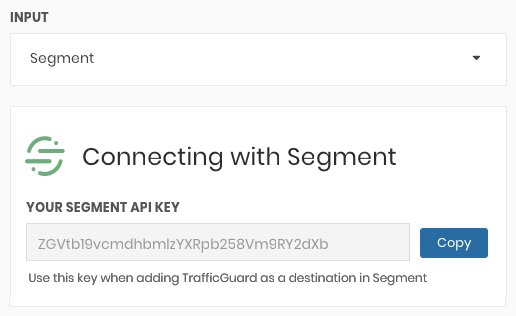 Drop in the “API Key” into your Segment Settings UI which you can find in your property in the TrafficGuard dashboard. Calls will now be visible in TrafficGuard dashboards in real-time. NOTE: For TrafficGuard to successfully validate calls, context.ip and context.userAgent values as well as either context.campaign.source, context.app.name or properties.url will need to be sent. Calls without those values will return an error. Page calls will be sent to TrafficGuard as a pageview event. Screen calls will be sent to TrafficGuard as a pageview event. The following track calls will be sent to TrafficGuard as events. All other calls will be recorded as pageview events until TrafficGuard supports ad hoc event types.